Create an atmosphere for open discussion among family members to identify and document the family’s objectives and core philosophies. Listen to each other and give everyone a voice. Recognise the validity of each individual’s views. Discuss, with the help of professional advisers if necessary, the different objectives and needs of individual family members, with a view to building a consensus. Go for consensus rather than edict. Make sure the family understands the business is a commercial venture that needs to be run in a professional manner. All family members should have significant work experience outside the business. Family members should only be employed on merit and in positions that they are qualified to occupy. Remuneration of family members should be no more favourable than that of equivalent non-family employees. Do not confuse remuneration with a return on share ownership. Institute appropriate appraisal procedures for all employees, whether family or not. Use outsiders, possibly non-executives, for appraisal of senior family management. Do not accept ‘it has been done that way since Grandad’s day’ as an excuse for not making change. When commercial reality requires change, change! Individuals’ objectives change over time – respect these changes and ensure they are articulated. Be outward looking. Consider using the services of a non-executive director (not a family member) to provide a more objective view in the planning and decision-making process. Identify which issues relate to family and which to business. As regards business issues, separate internal issues from external ones. Create the appropriate framework to deal with these separately. Succession planning needs to be started sooner rather than later. Ten years before a retirement is not too early. Consider all the succession options with an open mind – avoid sentimentality. Discuss them with others. Make sure the family is aware of your succession plans and intentions from the start. Commit your succession plan to paper. Smooth succession is not about what you do, it is about how you do it. Go when you say you will! These tips are reproduced from The Family Business Rulebook and are a representative sample only. 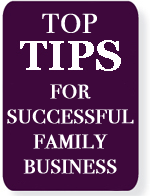 The Rulebook is available for download as a pdf and contains much more advice and guidance on running a successful family business. We also suggest reading and noting the Phrase Book available from the same place which translates some of the language used inside family business. It would be funnier were it not so serious and so ‘on the button’. We are grateful to Peter Leach LLP for permission to reproduce these tips for the newsletter.